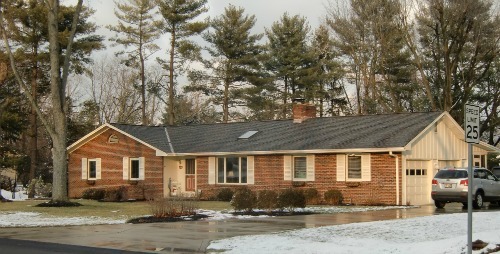 Ranch style home designs dominated suburban construction in the United States in the post-World War II period up until the 1980's. Perhaps the style was a victim of its own success. People grew tired of the look. Perhaps our affluence had something to do with it. Houses grew, and often the easiest way to grow was to add a floor, but a two-story house is no longer a ranch. As the name suggests the design originated in the west. Settlers moving into the Southwest encountered an existing culture of Spanish ranchers. Mexican settlers had learned to build low, flat-roofed adobe homes by coping the Native American settlements. Sometimes the roof style on these ranch homes was altered to have a pitch and used Spanish clay tiles. Whereas the Mission Revival style borrowed the basic elements of the Mexican home - its roof, its walls, its exposed ceiling beams - Ranch borrowed the layout of the Mexican home. Here is a panoramic view (slightly curved) of the main house at Tesoro Ranch, built by silent film star Harry Carey. It is made with adobe and is built in a style common to working ranch homes in California and much of the American Southwest. This basic form was later modified to take advantage of wood construction techniques and the ability of railroads to bring cheap wood to the Southwest. The result was a long and low, sprawling house with lapped wood-siding typical of most housing in the United States. Sometimes you will hear it referred to as the California Ranch Style, but eventually the "California" part was dropped. While Ranch style homes can be straight, they usually form an L or even a U. In modern suburban versions the bend that forms the L often holds the garage. Here brick replaces wood for the siding and the L-shape is almost non-existent, distinguished more by the gable than by any noticeable bumpout. Kudos to the builder of this house for putting the garage on the end instead of facing the front. In the 1940's the style became the favorite style of developers of tract housing. Suburban lots were often big enough to allow for wide house that would have been impractical in the cities. Ranch style home designs are one-story, so they were easy and quick to build. Early Ranch style architecture favored a rustic or western look, but as time wore on ranch style homes often adopted the look of "modern" or "colonial revival". It is fair to say that ranch style home designs can take on just about any look, although not always successfully. The term is more descriptive of the basic floor plan rather than any aesthetic effect. "Oh look, honey. A Greek pediment with columns. It's just like a Southern Plantation home!". Applying a Classical or Colonial look to Ranch Style homes often ends very badly. If you live in such a house understand that your house is very nice. I am simply talking about all those other houses. Ranch style homes can have just about any style of siding. Windows range from large, plate-glass picture windows, to sectioned colonial-style windows. There is a limit to flexibility when it comes to the roof. Houses with steep-sloped roofs lose that Ranch look. A "U" shaped Ranch. Note that the dominant dimension is the width. However, Ranch style home designs are able to accommodate dovecoats and gablets and other little roof extensions and complications. Having a shallow-pitch they tend to lack dormer windows and are rarely one-and-a-half stories, but sometimes they are split-level, where part of the house is a few feet lower than the rest of the house. Often this is the case where the house is built on a grade, but it can also work on flat lots where part of the house rests over a basement and part of it is on a slab. Ranch style homes were frequently modified to accommodate shallow porches. The Ranch came into popularity about the same time as air-conditioning, so porches lost some of their utility but porches were still popular with the American public. It was difficult to put a full-sized porch on Ranch style homes, so the solution was often to have a very shallow porch indented into the house. These porches were often so narrow as to lose their social function. Architect Christopher Alexander believes that any porch narrower than six feet deep loses its ability to serve as a place for conversation and social interaction. My own experience is that such porches soon become storage for bikes. This is the unfortunate fate of many poorly-designed porches on Ranch style homes. The only way that this porch is really functional as a porch is if the yard in front is transformed into a patio. In that case the thin porch gives an interesting dimension to the patio. I have heard the claim made that Ranch style homes have wide eaves, but my observation is that this is generally not the case. I am all for wide eaves as a practical matter, but they do add cost and quite a few ranches lost that design element in order to minimize costs. The interior of a Ranch is almost always an open floor plan. This is a product of its times. Most homes of this era are distinguished by a limited use of divisions between public rooms. Generally the rooms are relatively spare of ornamentation, with clean, simple lines. Since many of these houses are several decades old many have had alterations, and moldings and wainscoting were often added to accommodate the tastes of the owners, but remember these originated in Western ranches and simplicity of form was the general rule. An open floor plan in a contemporary ranch. Simplicity was the order of the day for Ranch style home designs. This house was built in 1953 by Cliff May, the architect who popularized Ranch style architecture This house is for sale. Something as loosely defined as Ranch style architecture can cover almost anything, but to be useful a definition has to have limits. A lot of houses are called "Ranch" that may no longer deserve the name, but to be fair they are often houses whose designs evolved from the original Ranch. In the last few decades it has become common to take the basic Ranch, give it a slightly steeper roof, and then project multiple gables off of the house. Complicated roofs like this are often quite pleasing, but part of the utility and appeal of Ranch style homes were their simplicity. Here is a super-sized Ranch. The dormers are small enough that the house still has that "Ranch" look to it, but the gazebo on the end is definitely a rarity. The roof has a steeper pitch than most and you can see that a shallower pitch would not support adding rooms in the attic. Sometimes the floor plan will wrap around in a "U" but then the architect will roof over the open part of the "U". In a sense it is still a Ranch, but since the effect is to make the footprint more like a square the house has lots its low-rambling character. This might be a great house design, but it has lots its right to be called a Ranch. Since there is no central architect's committee to enforce naming conventions builders will continue to call these "Ranch style home designs" but you will at least understand that this is something different. The biggest advantage of Ranch style home designs is that they are all on one level. Maybe this is just a preference for the young family, but people past retirement realize that stairs can be both a hindrance and a risk. You can avoid stairs by adding a residential elevator, but you can also move into a ranch and never have to face the stairs again. You also avoid the cost of stairs. Stairs take up a lot of floor space without adding living space. Avoiding this space either reduces your costs or adds to your usable space. The big disadvantage of a Ranch is its large footprint. 2500 square foot on one floor takes up more lot space than 2500 square foot of a two-story home. Where land is cheap this is not a big concern. Where land is expensive using ranch style architecture can add big costs to your home. Having laid out the story of Ranch style architecture I will give you my take on ranch style homes. Well, to be honest, I only detest most of them. Occasionally I come across a house that is so well-designed that I can't help but admire it. Good architecture can transcend my general dislike for this style. Part of my dislike for this style stems from its overuse by tract builders. Familiarity breeds contempt. Part of it is because of a strong preference on my part for multi-story homes. I just like them better. I grew up in houses with stairs. I looked out from windows with an elevation. They seem more like home. Part of it is because of its lack of a viewpoint A Ranch home is amorphous. In one neighborhood it stands dressed in stone, in another it is covered in wood. It can be modern, colonial, contemporary or western, all with the same floor plan. It stands for nothing on its own. Compare this to an Italianate. There is a look to an Italianate. It is not easily mistaken for a Greek Revival. It does not play well with Craftsman homes. It insists on being an Italianate. The Ranch does have its fans. They probably have good reasons for liking them and I will not hold this against them. I am just not one of them. If you want to see what I do like, check out Craftsman, Tudor, and Italianate homes. These tend to curl my toes and get me all excited. I am also a fan of a whole lot of oddball houses, especially those built with natural materials. I get a kick out of townhouses and how they solve the problems of living in a narrow space. I have an intellectual interest in bermed and underground houses, but haven't quite found one yet that solves the problem of light and view in a dark place. For those who are interested in Ranch style home designs please peruse the rest of my pictures. Simplicity itself. This Ranch achieves the traditional "L" shape with the help of a connecting, pass through porch. Vertical wood siding helps this Ranch house fit in with the trees. In some variations Ranch house style designs looked back to the natural materials (adobe and wood) that you might find on real ranch buildings, but there are far more Ranch style homes that ignore this altogether. 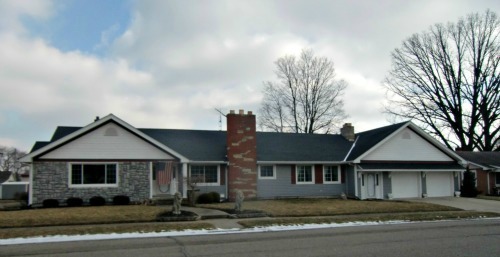 Here is a Ranch style home that is comfortable in its own skin. It is not striving to be something else. Here a gabled entryway takes on a modern flavor. It is a little more successful than the Greek pediment, but nothing else about this house supports the "Modern" theme that the architect is aiming for. This house is perhaps too compact to be a Ranch. Without that long, stretched-out feeling it has wondered a little too far from its roots to bear the name. Here is a pretty nice Ranch. The blend of brick and tan stucco or wood (I can't tell which) creates something close to a Tudor look. Perhaps we can say Tudor-inspired, for while it echoes the look it doesn't appear to be a cheap imitation. It is a far cry from the California adobe look, but Ranch style home designs were always about the basic floor plan of the ranch homes rather than the Southwestern aesthetic. Several houses on this page, all from the same town, have this telescoping roof line. In at least some of the cases the slab drops down as well. It seems to be just an aesthetic quirk of the architects rather than serving any practical purpose. Most true split-levels would have a drop of several feet. A slight nod to the Colonial, with the small panes and the shutters, but it doesn't try to oversell it. 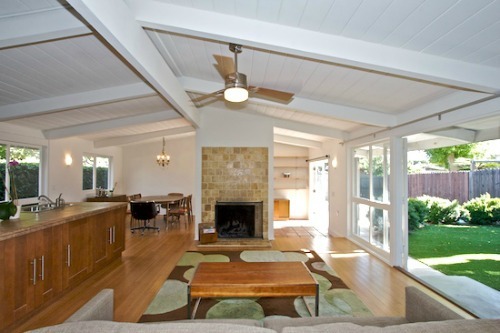 Ranch style home designs accommodated local tastes and the best guesses of the builders of what the public would buy.